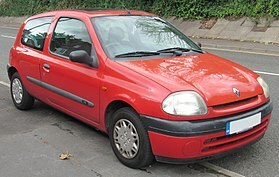 The Clio III uses the Nissan B platform, co-developed with Nissan (which Renault has a share in), that is shared with the Renault Modus, the Nissan Micra and the Nissan Note. It is considerably larger and 130 kg (287 lb) heavier as well as being more expensive than the Clio II, and, at nearly 4,000 mm (157 in) in length, has almost outgrown the supermini class. 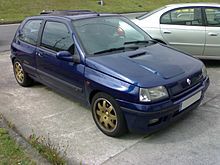 ^ "1993 Renault Clio Williams". 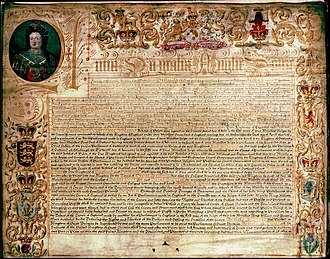 carfolio.com. Retrieved June 18, 2018. 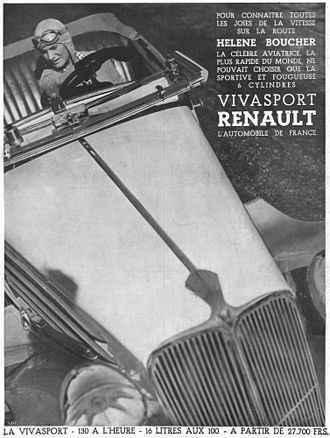 ^ "Renault Clio brochure" (PDF). Archived from the original (PDF) on 2017-11-07. Haren is an old municipality of Brussels in Belgium, that was merged into the municipality of the City of Brussels in 1921. It is an part of the municipality of the city and is situated at the north-eastern edge of the Brussels Capital Region. Dutch, French Haren has three stations, Buda on line 25 between Brussels and Antwerp, Haren on line 26 between Halle and Vilvoorde, and Haren Sud/Zuid on the line 36 Brussels–Leuven. The marshalling yard of the National Railway Company of Belgium, sometimes referred to as Schaarbeek Vorming, is located on the territory of Haren municipality. Haren is host to the headquarters of NATO, EUROCONTROL, as well as those of large international companies. The first Brussels airport was located in Haren, between 1914 and the early 1950s. The site, which was used by the Belgian Air Force, is being cleared for the construction of the new NATO HQ. 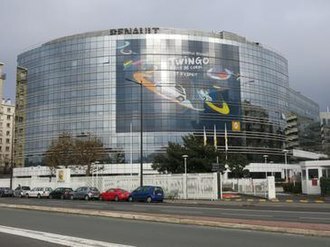 The current Brussels Airport site is located several kilometres to the east, between 1932 and 1997 Haren was the location of a Renault automobile factory, which in 1969, for the first time, produced more than 100,000 cars in a single year. 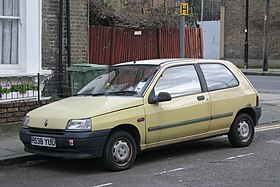 The Renault 5 is a supermini produced by French automaker Renault. It was produced in two generations 1972–1985 and 1984–1996, the R5 was sold in the US as Le Car, from 1976 to 1983. The Renault 5 achieved, like the original Mini, a cult status and details of the Renault 5 were published on 10 December 1971, the cars formal launch following on 28 January 1972. The Renault 5 was styled by Michel Boué, who designed the car in his spare time, when Renault executives learned of Boués work, they were so impressed by his concept they immediately authorized a formal development programme. 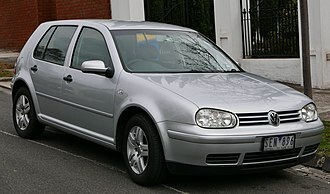 The R5 featured a sloping rear hatchback and front dashboard. 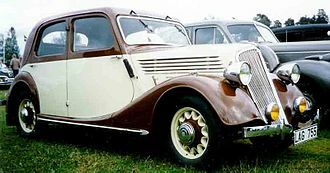 The 5 narrowly missed out on the 1973 European Car of the Year award, Boué died of cancer in 1971, just months before the car he designed was launched. The R5 borrowed mechanicals from the similarly popular Renault 4, using an engine driving the front wheels with torsion bar suspension. OHV engines were borrowed from the Renault 4 and larger Renault 8, there was a choice, at launch, a 5TS/5LS with the 1,289 cc engine from the Renault 12 was added from April 1974. As on the Renault 4, entry level Renault 5s had their engine sizes increased to 845 cc in 1976 and it was one of the first modern superminis, which capitalised on the new hatchback design, developed by Renault in the mid 1960s on its larger R16. 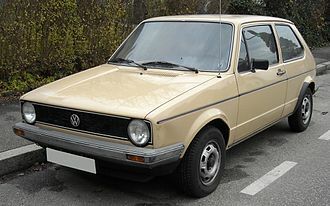 It was launched a year after the version of the Fiat 127. 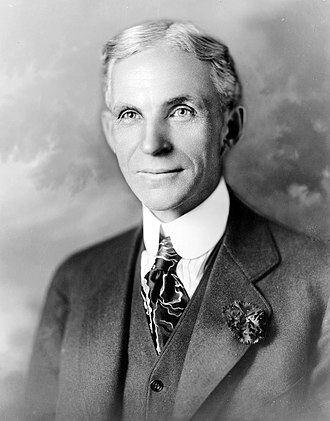 Within five years, a number of rival manufacturers - namely Ford, General Motors, although the mechanical components came from earlier models, body construction involved floor sections welded together with the other body panels, resulting in a monocoque structure. The approach had by become mainstream among many European automakers, the monocoque structure reduced the cars weight, but required investment in new production processes. The Renault 5 was targeted at cost conscious customers, and the entry level L version came with the same 782 cc power plant as the cheaper Renault 4, in 1972, it was priced in France at below 10,000 francs. From outside the TL was differentiated from the L by a chrome strip below the doors. 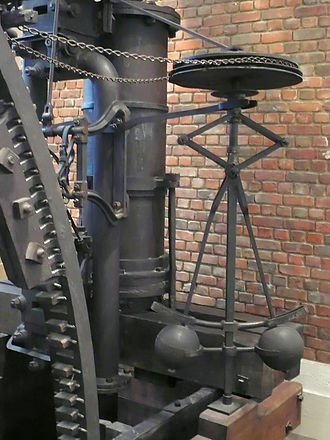 A floor-mounted lever employing a cable linkage replaced this arrangement in 1973, an automatic version, with the larger 1,289 cc engine, was added in early 1978. The Opel Astra is a compact car/small family car engineered and manufactured by the German automaker Opel since 1991. It is branded as the Vauxhall Astra in the United Kingdom, the Holden Astra was discontinued in Australia and New Zealand in 2009, because exchange rates made the car uncompetitive, and was replaced by the Holden Cruze. It briefly returned to the Australian market in 2012, for the first time badged as an Opel, on 1 May 2014, Opel announced that the Astra GTC and Astra VXR would return to Australia and New Zealand in 2015, again bearing the Holden badge. The Astra nameplate originates from Vauxhall, which had manufactured and marketed earlier generations of the Opel Kadett as the Vauxhall Astra, as of 2009, there have been four generations of the Astra. In a fashion typical for Opel they are designated with subsequent letters of the Latin alphabet, Opels official convention is that the Astra is a logical continuation of the Kadett lineage, the first generation of Opel Astra as the Astra F.
Another convention used by GM starts with Astra A, adopting the notion that the Astra is a separate model, models sold as Vauxhall, Holden, or Chevrolet have different generation designations reflecting the history of those nameplates in their home markets and their naming conventions. The Opel Astra F debuted in September 1991, with the Kadett Es successor, Opel adopted the Astra nameplate, which was already used by Vauxhall for the Kadett D and E. It was offered as a three- or five-door hatchback, a saloon, a cabriolet was offered and built by Bertone in Italy. 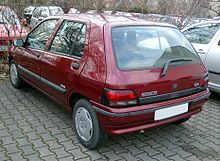 While the Astra F finished production in Germany in 1998, Polish-built Astras remained on offer in Central and Eastern Europe, as well as Turkey, the Opel Astra F consisted of two main revisions and was revised in 1995, with the launch of Opels new Ecotec engine. Aside from the South Africa-only 200t S, the model was the GSi – a 2.0 L I4 16V petrol injected model with 151 hp. It featured sports bodykit and widened front seats in the interior, some Astra models had an 1.6 L engine with 83 hp. The Renault Fuego is a sport compact car that was produced by French automaker Renault from 1980 to 1992, replacing the Renault 15 and 17 coupés of the 1970s. 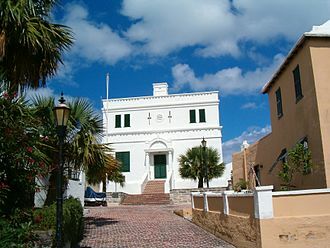 It was marketed in the United States by American Motors Corporation, the Fuegos exterior was designed by Michel Jardin, working under Robert Opron. The Renault Fuego was heavily based on the Renault 18, sharing its floorpan and drivetrain, the design kept the familiar double wishbone layout common with the Renault 18 but no parts were interchangeable and the design incorporated negative scrub radius geometry. The new suspension design would be introduced in the facelifted Renault 18, in 1984, the Fuego dashboard was added to the facelifted R18. 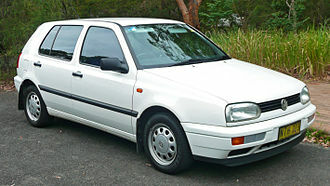 European production continued into 1986, while Renault Argentina produced the Fuego from 1982 until finally ending production in 1995 with the 2. 2-litre GTA Max and it was the first mass-produced four-seat sports model to be designed in a wind tunnel. The resulting drag coefficient factor of 0. 32-0.35 depending on model, in October 1982, the Turbo Diesel model was classified as the then-fastest diesel car in the world with a top speed of 180 km/h. The Fuego was the first car to have a remote keyless system with central locking that was available from the 1983 model year, the system was invented by Frenchman Paul Lipschutz, and introduced on other Renault models. The Fuego was the first car to have steering wheel mounted controls for the audio system. This feature became popularised on the new 1984 model Renault 25, a convertible version trimmed with a fine leather interior was unveiled by the French coachbuilder Heuliez in 1982, but never made it to production. The R11/Alliance convertible taking its place, European model variants ran as follows,1. 4-litre TL, GTL,1. 6-litre TS, GTS,2. 0-litre TX, and GTX. A2. 1-litre Turbo Diesel was produced for LHD European markets in the 1982-84 period, the Fuego Turbo was added in 1983 to coincide with the midlife facelift. 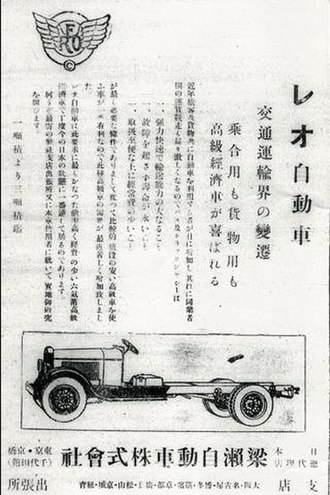 This included a new front grille, wheel design, interior trim and a revised dashboard on LHD models. In the United States, the Fuego was offered with a 1. 6-litre turbocharged or normally aspirated version in 1982 and 1983, the Fuego became the number one selling coupé in Europe during the years 1980 through 1982. 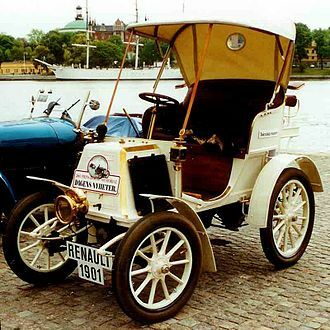 The official Renault website states that a total of 265,367 Fuegos were produced, in France the number produced from 1980 to 1985 was 226,583. 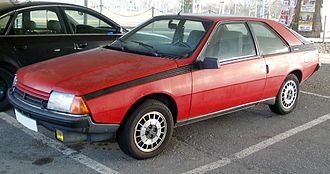 The Fuego was sold in the United States through American Motors dealers from 1982 to 1985 inclusive and it was a nicely executed sports coupe and was to be Renaults halo car. 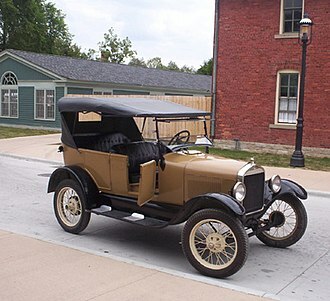 The car featured distinctive styling, comfort for four passengers, delivered superior fuel economy, economical to purchase, however, it did not achieve high sales and turn Renaults fortunes around in the United States. By 1984, AMC dealers were eligible for rebates of $300 and $1,000, the American Federalisation of the vehicle received negative reactions from the original design team due to the enlarged bumpers, sealed beam headlights, and Americanised colour/trim choices. Bursa is a large city in Turkey, located in northwestern Anatolia, within the Marmara Region. It is the fourth most populous city in Turkey and one of the most industrialized metropolitan centres in the country, the city is the administrative centre of Bursa Province. Bursa was the first major and second overall capital of the Ottoman State between 1335 and 1363, the ski resort of Mount Uludağ towers over it. The mountain was called the Mysian Olympus by the Romans who lived there before, Bursa has rather orderly urban growth and borders a fertile plain. The mausoleums of the early Ottoman sultans are located in Bursa, Bursa has thermal baths and several museums, including a museum of archaeology. The shadow play characters Karagöz and Hacivat are based on historic personalities who lived and died in Bursa, Bursa is home to some of the most famous Turkish dishes such as İskender kebap, specially candied marron glacés, peaches and Turkish Delight. Bursa houses the Uludağ University, and its population can claim one of the highest overall levels of education in Turkey, the historic towns of İznik and Zeytinbağı are all situated in Bursa Province. In 2015, Bursa had a population of 2,340,000, the earliest known human settlement near Bursas current location was at Ilıpınar Höyüğü around 5200 BC. It was followed by the ancient Greek city of Cius, which Philip V of Macedon granted to Prusias I, Prusias rebuilt the city and renamed it Prusa. 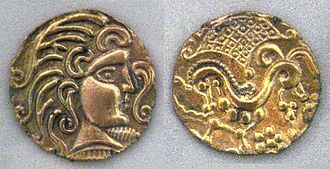 After 128 years of Bithynian rule, Nicomedes IV, the last King of Bithynia, an early Roman Treasure was found in the vicinity of Bursa in the early 20th century. 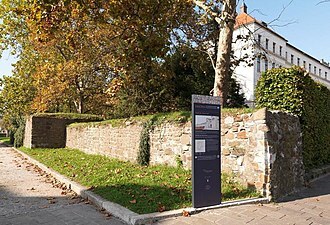 Composed of a womans silver toilet articles, it is now in the British Museum, Bursa became the first major capital city of the early Ottoman Empire following its capture from the Byzantines in 1326. 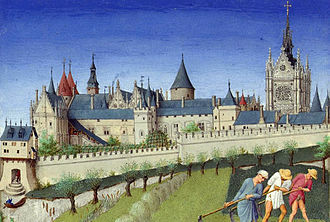 As a result, the city witnessed a considerable amount of growth throughout the 14th century. 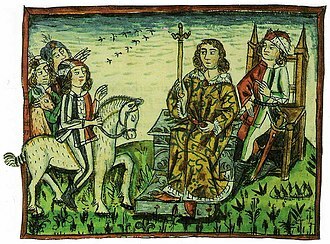 After conquering Edirne in East Thrace, the Ottomans turned it into the new city in 1363. The Ottoman sultan Bayezid I built the Bayezid Külliyesi in Bursa between 1390 and 1395 and the Ulu Cami between 1396 and 1400, Bursa remained to be the most important administrative and commercial centre in the empire until Mehmed II conquered Constantinople in 1453. Model of the "arènes de Lutèce"
The Renault Monaquatre was assembled at Vilvoorde between 1931 and 1933. 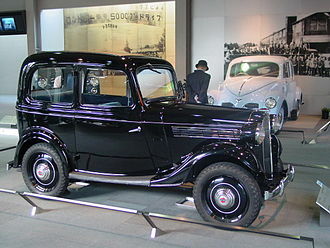 Although the saloon/sedan version of the Renault Juvaquatre was phased out in the early 1950s, the estate version, badged as the Renault Dauphinoise, continued in production at Vilvoorde till 1960. The first postwar design to be assembled at Vilvoorde was the Renault Dauphine. Vilvoorde assembled the Renault 6 between 1968 and 1980. 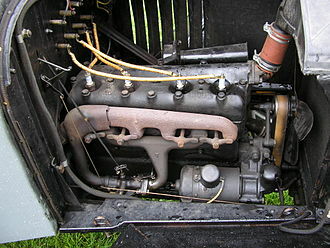 An F3R engine, installed in a Moskvitch 214145 "Svyatogor"